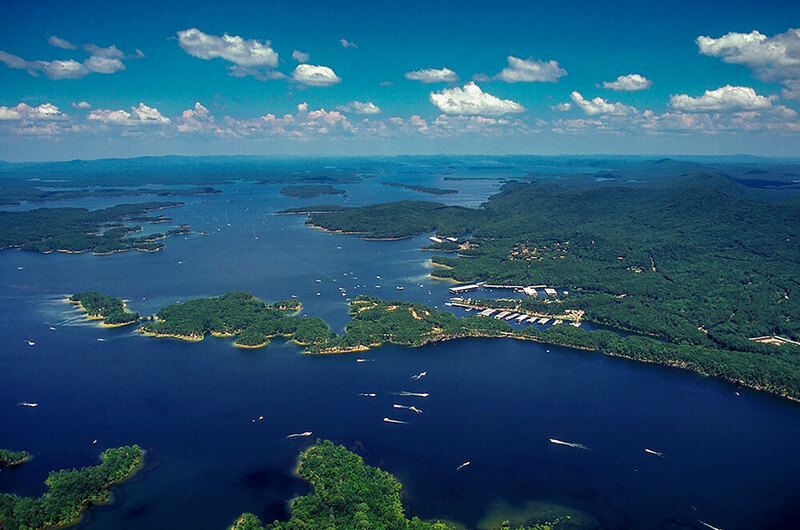 Lake Ouachita is a 40,100-acre man-made lake 44 miles west of Hot Springs, Arkansas. It is one of three man-made lakes along the Ouachita River – Lake Hamilton and Lake Catherine. It was created with the construction of the Blakely Mountain Dam in 1952. Lake Ouachita is the largest lake that is located entirely in Arkansas. The name Ouachita is officially pronounced as /WAH-shi-taw/. There are approximately 200 islands on the lake, which varies depending on the lake level, which also varies about 10 feet on average yearly. The lake is virtually surrounded by the Ouachita National Forest and has one of Arkansas’s most pristine shorelines at some 970 miles. The lake’s shorelines are home to more than 400 U.S. Army Corps of Engineers’ campsites. The Corps oversees about 66,000 acres of lake and shoreline. The lowest water level ever recorded for the lake was 535.86 feet, recorded in January 9, 1954. The highest ever recorded was 590.1 feet in 1982, the closest level it’s been to going over the spillway. During the clearing operations to create the reservoir, cemeteries were moved to new locations but few actual remains were found due to the acidic soil. Personal items found in the burial sites included a man’s watch, a celluloid collar and cuffs, and a mustache cup of ancient vintage. Lake Ouachita consistently ranks in the top 10 for largemouth bass fishing each year. Bassmaster Magazine selected Lake Ouachita as one of the country’s Top 100 Bass Lakes for May 2012. You can find many species of fish on the lake, such as Black/Largemouth Bass, Striped Bass, White Bass, Crappie, Bream/Sunfish, Walleye, and Catfish. The lake’s clear waters make it a prime destination for scuba divers. There are a total of 9 resorts on or close to the shores of Lake Ouachita, 20 recreation areas, and about 801 camping sites.